Vision: Why do you do what you do? According to Simon Sinek, author of Start with Why, people like Martin Luther King Jr., Steve Jobs, and the Wright Brothers had little in common, but they all started with WHY. They realized that people won't truly buy into a product, service, movement, or idea until they understand the WHY behind it. This is a powerful piece of visioning. His position is that “your why” is a critical part of creating a vision that really matters to your clients and your business. Generally, companies that understand their “why” focus on their business and are continuously tuning into how to deliver on their “why” to their clients. While companies that are fuzzy on their “why” tend to be completely obsessed with the competition vs. focusing on the very thing that will bring them the business they are dreaming of. 1. Why - This is the core belief of the business. It's why the business exists. 2. How - This is how the business fulfills that core belief. 3. What - This is what the company does to fulfill that core belief. Apple’s original mission statement was: "To make a contribution to the world by making tools for the mind that advance humankind." This was their why, their how and their what. Apple has been a long term “why” based organization and it shows in their actions and their results. 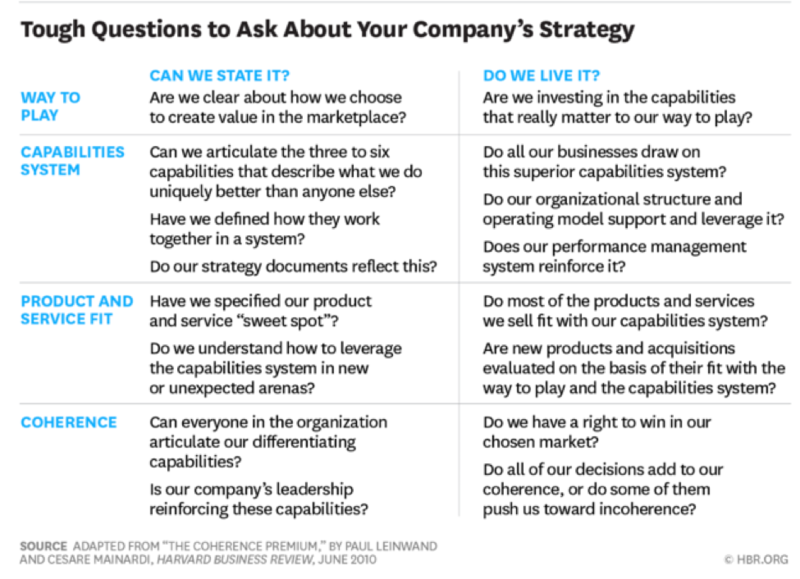 Once you have your vision, Harvard Business Review brings it to strategy by asking tough questions around how to play, capabilities, product and service fit, and coherence. Define your vision, create your strategy to achieve and execute. When you create a compelling vision, and pair it with an effective strategy—it’s a winning combination that can’t be beat.